The Navajo Zoo acquired two Desert Bighorn Sheep from the Navajo Nation populations in December 2011, and one more in 2015. We now have one ram and two ewes. These sheep were yearlings when we received them and continue to grow quickly on their grass hay diet. They were brought to the Navajo Zoo because of their cultural significance to the Navajo People, and as part of Dept. of Fish & Wildlife operations to manage our largest wild population. The Navajo Zoo has one Elk on exhibit; he is male (bull) that was brought to the Zoo by New Mexico Game & Fish Department in April 2007 after he was found orphaned. He arrived with his sister "Carin", who unfortunately died in 2015. Both had grown quite well from their first year at the Zoo. In January 2010, the Zoo lost its elderly cow Elk to a terminal medical condition; she was at the Zoo for 22 years! The Navajo Zoo has four Mule Deer on exhibit. One is a male deer named Bambi, whoi came to the Zoo as an orphaned fawn in June 2009 and was hand-raised by Zoo staff. In Nov 2012, we received 2 female deer, one of which is a fawn and one is a yearling. The fawn is now named Bella from her sponsor under our Adopt-an-Animal Program, while the other is named Jasmine. Both does were orphaned in Arizona and well taken care of by The Heritage Park Zoo in Prescott AZ before coming to The Navajo Zoo. In 2014, we received an orphan buck, named Pepsi. 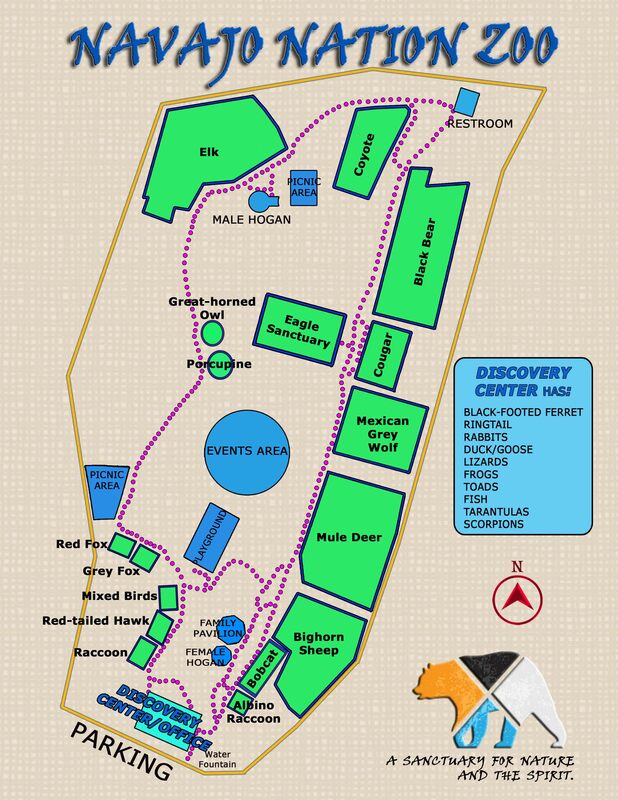 The Navajo Zoo has two Black Bears on exhibit. One is named Bessie, who was received as an orphaned cub in 2000. She was found near Heber, AZ when she was caught in a trap as a cub. In Nov 2012 we received Abbey, who was orphaned outside of Flagstaff AZ in August. She came to us at about 80 lbs. and very shy. On August 18, 2015, the Navajo Nation Zoo became the 22nd facility in the U.S. to have a live black-footed ferret exhibit. This federally endangered species has been in captive breeding programs since the mid-1980s. Our adult female was recently retired from the breeding program at the Phoenix Zoo at 4 years of age. The Navajo Zoo has two male Bobcats. BJ came to the Zoo as a kitten in July 2004 from Ft. Defiance AZ. Naabahi was also brought to the Zoo as an orphaned kitten, but 5 years later in November 2009. BJ was hesitant to share his enclosure at first, but they now have become best of friends. The Navajo Zoo has two Cougars on exhibit. We lost Sophie to old age in 2015; she originally came to the Navajo Zoo in 1997 from Yuma, AZ. In September 2011 we introduced two new older cubs to the exhibit. One is a male that already weighs 90-100 pounds before his first birthday; the other is a female (photo above) that is half the size of Sophie. The new male was named Hunter and the female was named Kay-bah through the Zoo's Adopt-an-Animal Program. The Navajo Zoo has two Coyotes, named Codee and Lucky Sophia. The Zoo acquired young Codee in May 2011 from Sanders, AZ, and Lucky Sophia came all the way from Mojave Valley, AZ in February 2012 to live at the Navajo Zoo. The Navajo Zoo has two resident Grey Foxes. Their names are Rexxy and Slug. Slug came to the Zoo with his mother Rexy in 2007. They were found just a mile from the Zoo in Tse Bonito, AZ. The Navajo Zoo houses one Red Fox on permanent exhibit. He is named Roxxy Brown. He arrived in June 2009 from Utah along with one sister and two brothers. Like in the wild, these foxes enjoy digging burrows within their enclosure at the Zoo. The Navajo Zoo has three Raccoons on exhibit. Two of them are pictured here, while the third is a very unique albino Raccoon. Chewy is our male raccoon pictured below; he came to the Zoo as an orphaned animal in July 2009. Mitzy is a female raccoon that was found orphaned near Chinle, AZ and brought to the Zoo in August 2010. Our large albino Raccoon is named Neko and came to the Zoo in September 2008 from Shiprock, NM. Chewy and Mitzy share an enclosure and enjoy climbing the juniper shrub inside. The Navajo Zoo has one resident Porcupine. We unfortunately lost Spike in 2014, who was found locally as a tiny orphan in 2001. Barb came to the Zoo in September 2008 and was also orphaned soon after birth. Barb is full-grown and weighs between 25 and 30 pounds. She really enjoys apples given as treats during tours with school children. The Navajo Zoo has one male Chipmunk on exhibit in the Discover Center. He is named Aiden, and he was orphaned in the wild and brought to the Zoo in October 2010. Aiden is a Gray-collared Chipmunk. The Navajo Zoo has one Tassel-eared Squirrel on exhibit in the Discovery Center. This squirrel is one of the Chuska Mountain subspecies, which is unique to the Navajo Nation. This squirrel was named Chusha Chai' in 2012 by his sponsor under our Adopt-an-Animal Program. The Navajo Zoo has two Prairie Dogs on exhibit in our Native Plant Exhibit....and a small number of them running loose throughout the Zoo grounds. One of the prairie dogs is named Jimmy and the other is un-named since it has not been adopted through our Adopt-an-Animal Program. The Navajo Zoo has three young Cottontails the Waterfall Exhibit in the Discovery Center. Each were found orphaned in the local Window Rock area during the summer of 2012 and brought to the Zoo when very young. One Cottontail was named "Uncle Mike" when it was adopted through our Adopt-an-Animal Program.